Monitoring group and Syrian opposition videos and accounts have been removed for violating YouTube’s guidelines. Middle East Eye, the monitoring organization Airwars, and the open-source investigations site Bellingcat are among a number of sites that have had videos removed for breaching YouTube’s Community Guidelines. Orient News, a Syrian opposition news site established in 2008, appears to have had its entire YouTube account removed. Airwars raised the issue on Twitter after a number of its videos – largely showing footage of air strikes – were removed for violating YouTube guidelines. Airwars later said its videos had been reviewed and restored but given 18+ age classifications. Eliot Higgins, of Bellingcat, made similar complaints. Middle East Eye has also had a number of videos removed, some of which were later given age restrictions, some of which remain removed. YouTube told MEE in an email that the video “Drone footage by Islamic State shows suicide car attacks on Iraqi forces inside Mosul” was removed and that YouTube had “assigned a Community Guidelines strike, or temporary penalty” to MEE’s account. 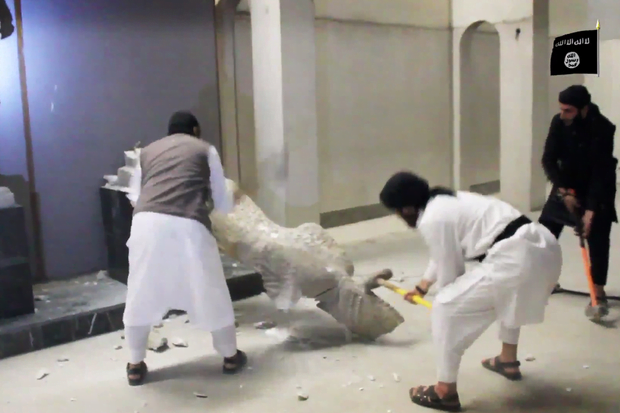 Another video, documenting the destruction of Nimrud by IS, which is widely available on the internet, was removed from a MEE staff account, and all appeals were rejected. O’Brien tweeted that, following “reconciliation” with YouTube over that video, another video, featuring al-Qaeda, was also removed despite it also having featured as evidence in the Manning trial. She said that she had received two community strikes and now risked having her account deleted. YouTube has faced mounting criticism about the presence of videos featuring “extremist” content from groups like al-Qaeda and the Islamic State, as well as far-right organisations. In response, the site announced it would be increasing the use of artificial intelligence to monitor and review content online. In a blog post last week the company announced it had begun “developing and implementing cutting-edge machine learning technology designed to help us identify and remove violent extremism and terrorism-related content in a scalable way”. It said that more than “75 percent of the videos we’ve removed for violent extremism over the past month were taken down before receiving a single human flag”. Google also announced that its engineers had developed technology to prevent re-uploads of extremist material content, using image-matching techniques. YouTube accounts face a three-strike policy in which they face being removed if they have three videos flagged up as in violation of the Community Guidelines. Dozens of YouTube accounts related to the Syrian civil war are thought to have been removed by YouTube. Some contained videos with graphic images from the conflict, although many videos just focused on politics and interviews. MEE contacted Orient News for comment but had yet to receive a response at time of publication. Chris Woods, the head of Airwars, told MEE that the trend exhibited by YouTube risked severely undermining work done by Syrian opposition activists during the six-year civil war. “I think what’s so troubling about this if we look at the Syrian accounts, this is video chronicling a six- or seven-year war, and some of the most important parts of that war from the perspective of Syrians,” he said. He said he was still in negotiations with YouTube over a number of videos. Some videos hosted by Airwars were duplicated on the page of US Central Command, but have not been removed from the latter. YouTube told MEE that while they couldn’t comment on individual cases, they said they were not aware “any particular type of content was being flagged over another”. “Previously we used to rely just on humans to flag content, now we’re using machine learning to flag content which goes through to a team of trained policy specialists all around the world which will then make decisions,” she said. Specifically asked why such a bulk of videos had been removed recently, the spokesperson said: “it could be that we now just have a greater awareness of the content on the platform and that a lot of this content could have been policy-violating and is now coming down”. Controversy over adverts being placed next to “inappropriate” content, including videos of fundamentalist Islamic preachers, white supremacists, and Neo-Nazis, led to an exodus of major companies from YouTube in March. An investigation by the Times newspaper said that UK taxpayer-funded government adverts and adverts from several media and retail companies including Channel 4, the BBC, Argos, and L’Oreal had appeared alongside “extremist” content.